Ascension Catholic is the oldest Catholic school in the Diocese of Baton Rouge, and traces its origins to the arrival in Donaldsonville of six Daughters of Charity in 1845. At the time, all of the United States was part of the Archdiocese of Baltimore, Maryland. In 1850--the same year that New Orleans became the second archdiocese in the United States--a large three-story brick convent building was constructed in Donaldsonville to serve as a hospital, school(originally known as St. Vincent Institute), and residence for the Daughters of Charity. In 1854 this convent building also became an orphanagefor children whose parents were killed by yellow fever. That 1853 epidemic killed more than 10,000 in the greater New Orleans area. In 1885, the Sisters of the Holy Family came to Donaldsonville and started St. Augustine School for African American children. In 1886, the Brothers of the Sacred Heart came to Donaldsonville to start a school for boys named St. Joseph Commercial Institute. With the establishment of St. Catherine Parish in 1924, St. Augustine School was renamed St. Catherine School. St. Joseph Commercial Institute became known as Catholic High School in 1930. In 1954 new high school facilities costing $238,000 were built for the high school divisions of St. Vincent Institute and Catholic High School. 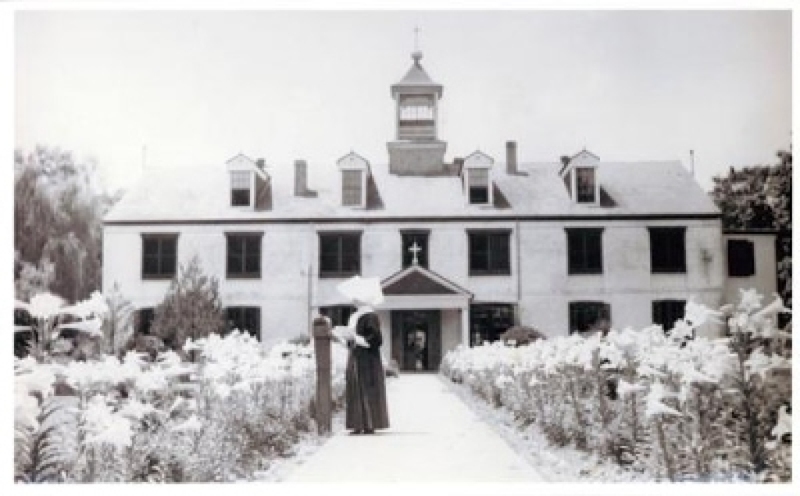 In 1961 a new convent building costing $132,000 was built for the residence of the Daughters of Charity, and the 1850 convent was entirely used to house the elementary division of St. Vincent Institute. The high school division of St. Catherine School merged with St. Vincent Institute and Catholic High School in 1965, and in 1969, all three original schools merged to become Ascension Catholic Interparochial Schools. The 1850 convent building housed the elementary division and the St. Catherine School campus housed the middle school division. Between 1969 and 1975, $439,000 would be spent to build a new classroom wing at the middle school campus, a new classroom wing at the elementary school campus, and a new Administration building and library building at the high school campus. 1845 January 1, 5:30 am., The Sisters of Charity of St. Joseph arrived from Emmittsburg, Maryland to open St. Vincent's Institute. 1850 The Sisters of Charity of St. Joseph became the Daughters of Charity of St. Vincent de Paul. The Old Convent building was completed to serve as a hospital. 1861 Hospital closed due to lack of funding — 13 orphans accepted. 1862 Federal troops took New Orleans and bombarded and burned Donaldsonville. Orphans were given refuge in the Sacred Heart Convent when St. Vincent's Institute was threatened to be burned. Sgt. Scott, who killed the Union Lieutenant who ordered it burned, saved the building, but was later executed for his act. 1885 The Sisters of the Holy Family opened St. Augustine's School for Black children. 1887 December 20, The Brothers of the Sacred Heart opened St. Joseph Commercial Institute for boys located on Paradise Alley. 1894 St. Joseph Commercial Institute was chartered as an institute with power to grant degrees. 1929 Football team was in existence. 1930 St. Joseph Commercial Institute became Catholic High School. 1931 St Marie Fogerty assigned to St. Vincent Institute. 1941 Football team was State Champs. 1942 St. Augustine's School was renamed St. Catherine School. 1955 Ascension Catholic High School built. St. Vincent's Institute was on one wing and Catholic High School was on the other wing. 1961 New convent completed for Daughters of Charity. 1963 Catholic High School discontinued boarding students. 1964 The Daughters of Charity exchanged their traditional habits with the white coronet for a more practical dress. 1965 St. Catherine High School was dosed; the students were allowed to transfer to Ascension Catholic with grades 5-8 housed at St. Catherine, renamed ACMS. 1968 The Brothers of the Sacred Heart departed. 1969 All three schools, St. Vincent's, Ascension Catholic Middle, and Catholic High School were amalgamated into Ascension Catholic Interparochial School to serve 14 church parishes. The schools were under the direction of the Daughters of Charity assisted by the Sisters of the Holy Family. 1970 Catholic High School (old rectory) burned. 1969-1975 Ascension Catholic Primary school built 11 new classrooms, but they continued to use space in the St. Vincent Institute building (built in 1850). Four new classrooms were built at Ascension Catholic Middle School, and a new administration building, library and class rooms were built at Ascension Catholic High School. 1973 Football team was State Champs. 1977 Ascension Catholic High School was accredited by Southern Associa­tion of Colleges and Schools. 1978 St Natalie Marengo awarded prize in national contest by Scholastic Magazine. 1980 ACIS Development Program was established with a major fund raising drive. 1981 Sr. Marie Fogerty died in January The Sisters of the Holy Family withdrew in June. 1987 The Daughters of Charity of St. Vincent de Paul withdrew. 1992 Football team was State Champs. 1993 Baseball team was State Champs. 1994 Baseball team was State Champs. Blue Ribbon Committee reactivates the ACIS Development Program. 2006 Marie U. Fontana, Founder of the Ascension Catholic Alumni Association died on April 28, 2006. Alumni Association was founded in 1983. 2008 Renovation and dedication of four classrooms on the second floor of the "old convent"